Abstract: Surface plasmon polaritons (SPPs) are fundamental collective charge density excitations at surfaces of solid-state plasmas, whoe strongly enhanced and confined electromagnetic fields can assist physical and chemical processes at the nanoscale. Therefore, the control of the spatiotemporal evolution of their energy, momentum, and spin is necessary to effectively transfer their quantum properties to nanoscopic objects, such as molecules. Thus, to design the coupling of SPPs into other modes of an electronic system, it is important to describe their coupling mechanism and nano-femto spatiotemporal distributions. In this talk, I will discuss the spatial-temporal distributions of SPPs mode at thermally evaporated silver (Ag) films, with a semi-ellipse coupling structure that acts as a converging lens, under both linearly and circularly polarized femtosecond light pulses. The propagation and focusing of SPPs are recorded as movies of their pump-probe pulse interference patterns with the excitation light by ultrafast interferometric time-resolved two-photon photoemission electron microscopy (ITR-2P-PEEM). The observed PEEM images of SPPs for p-polarized excitation light shows a symmetric field distribution with a distinct focal spot, but with circularly polarized excitation the lens structure also acts as a quantum spin Hall device, where light helicity dependent asymmetric launching and focusing is observed. Furthermore, the generated chiral density of the SPP field is spatially dependent on the focusing conditions and helicity of the excitation light. We demonstrate that the SPP fields excited by circularly polarized light (CPL) are focused to a focal point of high chiral density with the location and sign defined by the light-helicity, which can be utilized to design electromagnetic interactions with chiral objects, such as molecules. Bio: Yanan received his bachelor degree of physics in Shandong university, China, 2009. 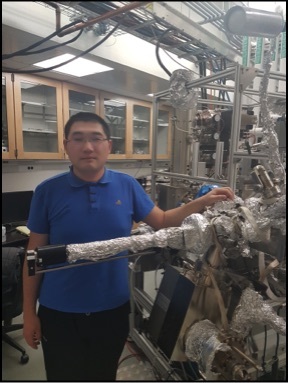 He joined Prof. Hrvoje Petek’s group in 2013, where he has been studying the coupling, spatial-temporal distribution surface plasmon polaritons (SPPs) field on metal surfaces, such as silver (Ag), using interferometric time-resolved photoemission electron microscopy (ITR-PEEM). Abstract: Surface plasmon polaritons (SPPs) are fundamental collective charge density excitations at surfaces of solid-state plasmas, whose strongly enhanced and confined electromagnetic fields can induce physical and chemical processes at the nanoscale. Therefore, learning how to generate and image the SPPs is very useful for us to understand the generation, propagation, and decay of SPPs. Time-resolved photoemission electron microscopy (TR-PEEM) is a common way to probe SPP dynamics. Such methods employ interference between SPP and optical fields to capture the SPP dynamics. The interference can occur for oblique or normal incidence, but the normal incidence is less well understood. In this talk, I will discuss generating and imaging for the SPPs at thermally evaporated silver (Ag) films, with some simple SPP coupling structures for normal incidence, such as a circular grating coupler and some simple vortex generating structures. The complexity of normal incidence PEEM measurements that we intend to unravel is that interference between the incident and SPP fields can occur only for the in-plane components, but the photoemission signal is dominated by the out-of-plane SPP field. The goal for my research is to understand how these two features influence the PEEM images. Bio: Zhizang received his Bachelor's degree in Physics at Southeast University in China. He is a 3rd year graduate student in Dr. Petek's group, University of Pittsburgh. 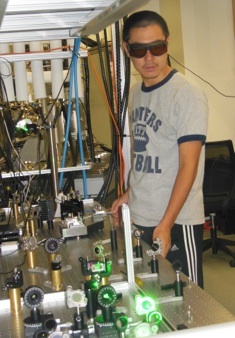 He has been studying Electron Microscopy(AC-LEEM/PEEM).